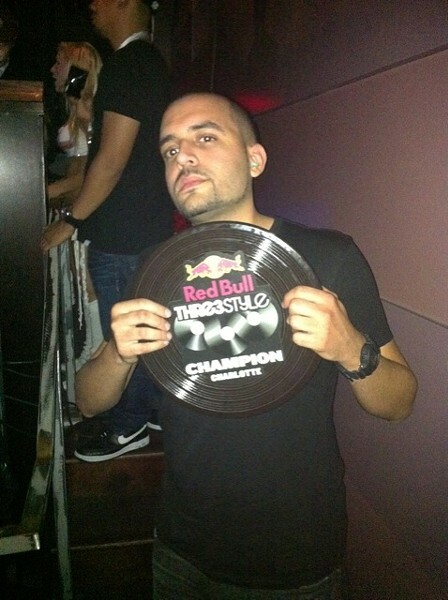 Congrats go out to Raleigh's DJ Forge, who won the Red Bull's Thre3style DJ competition, held last night at Phoenix. This is the second year in a row he has taken the title. Each DJ had a 15-minute spin session, and judging was based on choice of songs, creativity, skills and of course, the audiences response. The vibe at this year's competition was very different from last year's, which was also held in the same venue. Being as Thursday nights are usually Phoenix's college night, the atmosphere was more about the party instead of the music. But that doesn't mean that the battling DJs didn't bring their best (even if a couple of them did look kind of nervous). I will say, though, that I can definitely go without hearing Petey Pablo's North Carolina-praising song "Raise Up" for a while. And I was a bit surprised that DJ Forge ended his set with Enrique's song "Hero." When he stood there, his arms crossed over his chest in triumph, as the seconds counted down to zero, I couldn't help but think, "Wow. He's really ending it like this?" It was original, to say the least. But what do I know? The crowd was loving it, and apparently, so did the judges.